At St Xavier`s School he took brief interest in drawing and painting. 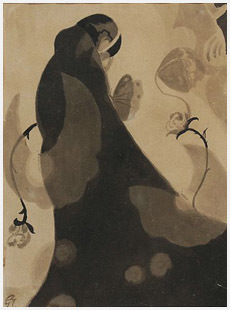 Gaganendranath was influenced and inspired by Japanese Art after coming in contact with Kakuzo Okakura and some other Japanese artists who came to India in 1902. He learnt the technique of brush and ink from them. He was a self taught artist having no academic training in art. 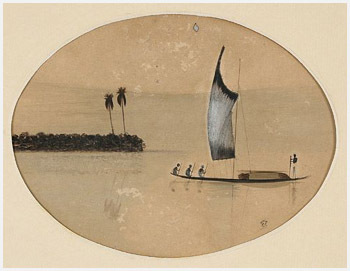 1908 Inaugural Exhibition: Indian Society of Oriental Art, Calcutta (Also in 1910,12). 1909 Indian Society of Oriental Art Exhibition, Simla. 1911 Indian Society of Oriental Art, United Provinces Exhibition, Allahabad. 1911 Festival of Empire, Crystal Palace, England (Organised by Indian Society of Oriental Art for George Vs Coronation). 1914 22nd Exhibition of Societe des Peintres Orientalistes Francais, Grand Palais, Paris. Travelling to Belgium, Holland and Imperial Institute, England. 1915-16 Indian Society of Oriental Art Exhibition, Calcutta and Young Men`s Indian Association, Madras. 1924 Travelling Exhibition, USA (organised by American Federation of Art and Indian Society of Oriental Art). 1928 Exhb. at Athenee Gallery, Organised by James Cousins, Geneva, Switzerland. Academy of Fine Arts, Kolkata. Bharat Kala Bhavan, Hindu University, Varanasi. Kala Bhavan, Visva Bharati, Santiniketan. H.K.Kejriwal Collection and Karnataka Chitrakala Parishad, Bangalore. Gaganendranath, through his experimental play with brush and colour, captured the charming capriciousness of refracted light. A master of beautiful geometric composition as he was Gaganendranaths work should yet be characterized not as aesthetic in absolute sense, but as emotive. His mind was on creating forms for their own sake. His cartoons reflects his treatment of the scenes of Calcutta and the funny side of the life of its citizens bear testimony to his sensibility and his power of acute observation.